I’ve always loved the books of Stuart MacBride, I have every single Logan MacRae book, most of which have been delightfully defaced in someway by old Beardy Boy himself, along with Halfhead, Sawbones, and the Twelve days of Christmas collection. 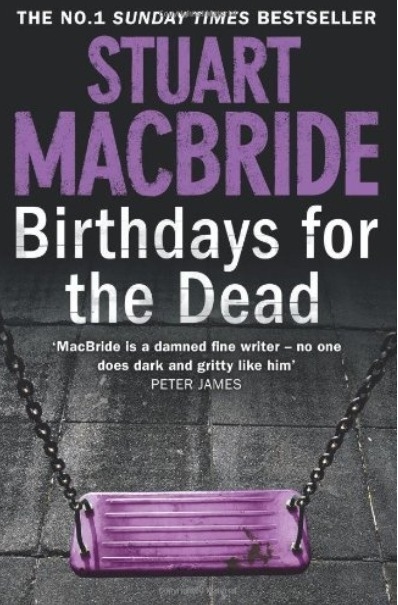 Yes, it would be fair to call me a fan, and so yes, as such I grabbed my copy of his latest standalone novel Birthdays for the Dead, as soon as it came out. With its immediate hook catching you, this is one book you won’t want to put down until you’re done. I didn’t think MacBride could get any better. I was wrong. Five years ago his daughter, Rebecca, went missing on the eve of her thirteenth birthday. A year later the first card arrived: homemade, with a Polaroid picture stuck to the front – Rebecca, strapped to a chair, gagged and terrified. Every year another card: each one worse than the last. The tabloids call him The Birthday Boy. He’s been snatching girls for twelve years, always in the run-up to their thirteenth birthday, sending the families his homemade cards showing their daughters being slowly tortured to death.